They made a small profit of £4,500 in 2013, then recorded a £230,000 profit for 2014 - the season in which the Bears won the T20 Blast. New Warwickshire chief executive Neil Snowball, who took over on 6 January following Povey's farewell on 16 December, also points to an 86 per cent increase in attendances and a consequent 43 per cent increase in revenue. "Whilst hosting an Ashes Test is a great opportunity, the club had to work very hard to maximise this opportunity," he said. "It is also very encouraging to be rewarded for the increased investment in T20 cricket. "The regular opportunity to watch Birmingham Bears on a Friday night, allowing under-16s in for free has made T20 cricket at Edgbaston a very exciting proposition. We have ambitious plans to grow further in 2016." Edgbaston is scheduled to host England's One-Day International against Sri Lanka on Friday, 24 June. The 25,000 capacity ground is also to host the second Test against Pakistan from 3-7 August. Warwickshire's home will also hosts T20 Blast Finals Day on Saturday, 20 August. In the second year of their latest four-year agreement which goes up to 2018, it will be the eighth time the county have been chosen as hosts in the 14 seasons of domestic Twenty20 cricket. 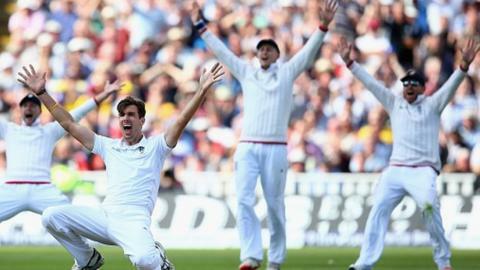 Edgbaston, which hosted Finals Day in 2004, 2007, 2009 and 2011, has now hosted it consecutively since 2013. After a six-year run at Birmingham, Trent Bridge will have it in 2019. From 2016 to 2019, Edgbaston is scheduled to host 35 days of big-match cricket: A Test match each year - including one of the Ashes Tests in 2019) - as well as five matches, including one of the semi-finals, in both the 2017 ICC Champions Trophy and the ICC Cricket World Cup in 2019.